Stand up for Schools/March for Education: our UNISON branch will also backing this demonstration, called by the London region of the National Union of Teachers, Tuesday evening (25 June) from 5.00 PM to oppose the privatisation of schools, demand funding for the building of new local authority schools and defend teachers’ pay and conditions. The march will assemble in the piazza outside the Westminster Cathedral very near Victoria Tube, SW1. The demonstration comes as teachers in the North West of England are about to kick off a campaign of industrial action from Thursday of this week against Education Secretary’s relentless assault on teachers’ pay and conditions, and the very notion of comprehensive state education. Stop the English Defence League (EDL): The violently racist, far-right EDL is once more trying to mobilise on the streets of London in an attempt to fuel an anti-Muslim backlash in the wake of the brutal murder of the soldier Lee Rigby in Woolwich last month. The organisation is threatening to hold a rally in Woolwich at the end of a march through six London boroughs including Tower Hamlets and Newham, which have large populations of South Asian and Somali origin. At present Unite Against Facism to which the branch is affiliated has called for a counter demonstration to assemble across from the Downing Street gates in Whitehall, SW1 from 11.00 AM this coming Saturday 29 June. 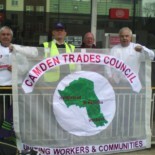 This entry was posted on June 25, 2013 by CAMDEN TRADES COUNCIL.